We report here a nanostructure that traps single quantum dots for studying strong cavity-emitter coupling. The nanostructure is designed with two elliptical holes in a thin silver patch and a slot that connects the holes. This structure has two functionalities: (1) tweezers for optical trapping; (2) a plasmonic resonant cavity for quantum electrodynamics. The electromagnetic response of the cavity is calculated by finite-difference time-domain (FDTD) simulations, and the optical force is characterized based on the Maxwell’s stress tensor method. To be tweezers, this structure tends to trap quantum dots at the edges of its tips where light is significantly confined. To be a plasmonic cavity, its plasmonic resonant mode interacts strongly with the trapped quantum dots due to the enhanced electric field. Rabi splitting and anti-crossing phenomena are observed in the calculated scattering spectra, demonstrating that a strong-coupling regime has been achieved. The method present here provides a robust way to position a single quantum dot in a nanocavity for investigating cavity quantum electrodynamics. C. Monroe, “Quantum information processing with atoms and photons,” Nature 416, 238–246 (2002). I. Fushman, D. Englund, A. Faraon, N. Stoltz, P. Petroff, and J. Vučković, “Controlled phase shifts with a single quantum dot,” Science 320, 769–772 (2008). T. M. Babinec, B. J. Hausmann, M. Khan, Y. Zhang, J. R. Maze, P. R. Hemmer, and M. Lončar, “A diamond nanowire single-photon source,” Nat. Nanotechnol. 5, 195–199 (2010). V. Vuletic, “All-optical switch and transistor gated by one photon,” Science 341, 768–770 (2013). T. Volz, A. Reinhard, M. Winger, A. Badolato, K. J. Hennessy, E. L. Hu, and A. Imamoğlu, “Ultrafast all-optical switching by single photons,” Nat. 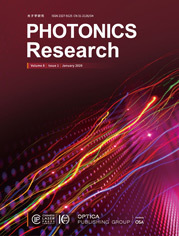 Photonics 6, 605–609 (2012). I. Shomroni, S. Rosenblum, Y. Lovsky, O. Bechler, G. Guendelman, and B. Dayan, “Quantum optics all-optical routing of single photons by a one-atom switch controlled by a single photon,” Science 345, 903–906 (2014). H. J. Kimble, “Strong interactions of single atoms and photons in cavity QED,” Phys. Scripta T76, 127–137 (1998). C. Weisbuch, M. Nishioka, A. Ishikawa, and Y. Arakawa, “Observation of the coupled exciton-photon mode splitting in a semiconductor quantum microcavity,” Phys. Rev. Lett. 69, 3314–3317 (1992). J. P. Reithmaier, G. Sęk, A. Löffler, C. Hofmann, S. Kuhn, S. Reitzenstein, L. V. Keldysh, V. D. Kulakovskii, T. L. Reinecke, and A. Forchel, “Strong coupling in a single quantum dot-semiconductor microcavity system,” Nature 432, 197–200 (2004). K. Hennessy, A. Badolato, M. Winger, D. Gerace, M. Atatüre, S. Gulde, S. Fält, E. L. Hu, and A. Imamoğlu, “Quantum nature of a strongly coupled single quantum dot-cavity system,” Nature 445, 896–899 (2007). J. Miguel-Sánchez, A. Reinhard, E. Togan, T. Volz, A. Imamoglu, B. Besga, J. Reichel, and J. Estève, “Cavity quantum electrodynamics with charge-controlled quantum dots coupled to a fiber Fabry-Perot cavity,” New J. Phys. 15, 045002 (2012). J. Bellessa, C. Bonnand, J. C. Plenet, and J. Mugnier, “Strong coupling between surface plasmons and excitons in an organic semiconductor,” Phys. Rev. Lett. 93, 036404 (2004). N. T. Fofang, T. H. Park, O. Neumann, N. A. Mirin, P. Nordlander, and N. J. Halas, “Plexcitonic nanoparticles: plasmon-exciton coupling in nanoshell-J-aggregate complexes,” Nano Lett. 8, 3481–3487 (2008). J. Dintinger, S. Klein, F. Bustos, W. L. Barnes, and T. W. Ebbesen, “Strong coupling between surface plasmon-polaritons and organic molecules in subwavelength hole arrays,” Phys. Rev. B 71, 035424 (2005). R. Chikkaraddy, N. B. De, F. Benz, S. J. Barrow, O. A. Scherman, E. Rosta, A. Demetriadou, P. Fox, O. Hess, and J. J. Baumberg, “Single-molecule strong coupling at room temperature in plasmonic nanocavities,” Nature 535, 127–130 (2016). K. Santhosh, O. Bitton, L. Chuntonov, and G. Haran, “Vacuum Rabi splitting in a plasmonic cavity at the single quantum emitter limit,” Nat. Commun. 7, 11823 (2016). R. Liu, Z.-K. Zhou, Y.-C. Yu, T. Zhang, H. Wang, G. Liu, Y. Wei, H. Chen, and X.-H. Wang, “Strong light-matter interactions in single open plasmonic nanocavities at the quantum optics limit,” Phys. Rev. Lett. 118, 237401 (2017). S. Kühn, U. HåKanson, L. Rogobete, and V. Sandoghdar, “Enhancement of single-molecule fluorescence using a gold nanoparticle as an optical nanoantenna,” Phys. Rev. Lett. 97, 017402 (2006). S. Schietinger, M. Barth, T. Aichele, and O. Benson, “Plasmon-enhanced single photon emission from a nanoassembled metal-diamond hybrid structure at room temperature,” Nano Lett. 9, 1694–1698 (2009). K. Matsuzaki, S. Vassant, H.-W. Liu, A. Dutschke, B. Hoffmann, X. Chen, S. Christiansen, M. R. Buck, J. A. Hollingsworth, S. Götzinger, and V. Sandoghdar, “Strong plasmonic enhancement of biexciton emission: controlled coupling of a single quantum dot to a gold nanocone antenna,” Sci. Rep. 7, 42307 (2017). M. P. Busson and S. Bidault, “Selective excitation of single molecules coupled to the bright mode of a plasmonic cavity,” Nano Lett. 14, 284–288 (2014). P. Zhang, L. Kong, P. Setlow, and Y. Q. Li, “Multiple-trap laser tweezers Raman spectroscopy for simultaneous monitoring of the biological dynamics of multiple individual cells,” Opt. Lett. 35, 3321–3323 (2010). L. Novotny, R. X. Bian, and X. S. Xie, “Theory of nanometric optical tweezers,” Phys. Rev. Lett. 79, 645–648 (1997). S. Lin, W. Zhu, Y. Jin, and K. B. Crozier, “Surface-enhanced Raman scattering with Ag nanoparticles optically trapped by a photonic crystal cavity,” Nano Lett. 13, 559–563 (2013). M. L. Juan, R. Gordon, Y. Pang, F. Eftekhari, and R. Quidant, “Self-induced back-action optical trapping of dielectric nanoparticles,” Nat. Phys. 5, 915–919 (2009). Y. Pang and R. Gordon, “Optical trapping of 12 nm dielectric spheres using double-nanoholes in a gold film,” Nano Lett. 11, 3763–3767 (2011). R. A. Jensen, I. Huang, O. Chen, J. T. Choy, T. S. Bischof, M. Lončar, and M. G. Bawendi, “Optical trapping and two-photon excitation of colloidal quantum dots using bowtie apertures,” ACS Photon. 3, 423–427 (2016). E. D. Palik and E. D. Palik, Handbook of Optical Constants of Solids (Academic, 1985). Y. Harada and T. Asakura, “Radiation forces on a dielectric sphere in the Rayleigh scattering regime,” Opt. Commun. 124, 529–541 (1996). Fig. 1. Optical trapping of quantum dots for the study of the strong light–matter interaction. (a) Nanotweezers with double holes in a silver patch. (b) Scattering spectrum of the nano-structure without quantum dots. The spectrum is normalized to its maximum. (c) Electric field distribution in the x–y plane located at the top surface of the silver patch. (d) Electric field distribution in the x–z plane bisecting the nanostructure. Gray areas indicate the structures. Fig. 2. Optical force generated by the localized surface electromagnetic field. (a) Electrical field distribution of the nanocavity in the x–z plane bisecting the structure when a quantum dot is present at one of the tips. (b) Optical force on the quantum dot as a function of trapping laser wavelength. (c) Optical force vector field in the x–y plane located at the top surface of the silver patch. (d) Optical force vector field in the x–z plane bisecting the structure. Fig. 3. Optical force on a quantum dot located at different positions in the cavity. (a) X component of the optical force as a function of the x coordinates of the quantum dot. The y and z coordinates of the quantum dot are fixed at 0 and 19 nm, respectively. (b) Z component of the optical force as a function of the z coordinates of the quantum dot. The x and y coordinates of the quantum dot are fixed at 4.4 and 0 nm, respectively. The solid curves are calculated from the Maxwell’s stress tensor, and the dashed lines are calculated from the electric field intensity gradient of the bare cavity. The intensity of the trapping laser used in the simulation is 1 mW/μm2. The dashed curves are magnified by a magnitude of five orders for display. MST, Maxwell’s stress tensor method; gradient, field intensity gradient method. Fig. 4. Scattering spectra of the nanocavity and the trapped quantum dots. (a) Scattering spectrum of the nanotweezers with two quantum dots trapped at the edges of the cavity’s tips. Quantum dots are resonant with the nanocavity. (b) Scattering spectra of the nanotweezers with two trapped quantum dots having various emissions. Spectra are ordered by the detuning energy of the quantum dots from the plasmonic cavity.